Andrew Kusmin, a nationally acclaimed watercolor painter, dedicated teacher and the author of "Palette of Dreams," will share the story of his artistic and personal journey at 2 p.m. Sunday, Feb. 24, in the Whiton Room at the Hingham Public Library, located at 66 Leavitt St. The artist will present a selection of paintings not included in "Treasured Trash," his North River Arts Society-sponsored exhibit currently on display in the library's Dolphin Gallery, as he shares inspirational stories and humorous anecdotes about his experience as an artist and his philosophy of art and life. "What's Behind the Palette" is also your opportunity to participate in Kusmin's first artist's talk since being awarded the honor of Signature Membership in the American Watercolor Society, the country's oldest and most distinguished association of watercolor painters. This Feb. 24 program is designed to reflect the spirit behind Kusmin's book, "Palette of Dreams," by melding an up-close and personal viewing of an artist's work with the stories and experiences behind and within them. "Palette of Dreams" presents more than 200 of Kusmin's paintings across nine themed chapters interwoven with insightful text that together detail and illustrate his life and work, as well as his message of support for artists, would-be artists and art lovers everywhere. Reviewers note that, while the paintings are beautifully presented, this is not purely a coffee table art book but a work as important to read and reread as it is to view. Not a traditional "how-to" book, though Kusmin does share a variety of helpful hints with his readers, this is a guided tour to discovering not just what, where or how to paint but "why" to paint – the foundation upon which all art is created. Kusmin, a Plymouth native, traveled an unconventional artistic path. He was happily pursuing a successful, longtime career in dentistry when he decided to enroll in a watercolor class at an art center in Westford, where he based his practice and raised his family. That experience unveiled another powerful aspect of his identity, one that opened the door to a new and different life and passion. Mentored by a series of artists, all extraordinary in their own right, in 2000 he took a leap of personal faith and returned to his hometown to pursue art full time. A signature member of multiple art societies across the country, Kusmin's work has been exhibited nationwide by such organizations as the National Watercolor Society, the American Watercolor Society, Watercolor Art Society–Houston, the Salmagundi Club National, Knickerbocker Arts National and the New England Watercolor Society, where he also served as president. 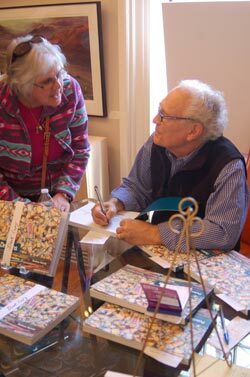 He has received awards from numerous local, regional and national organizations and his work has been published in a variety of highly respected art books and magazines. As an artist, Kusmin also quickly came to realize that supporting the arts, both as an advocate for local access and as a teacher, is an integral and inherent part of his mission. He spearheaded the reclamation and transformation of a historic church in Westford and the historic Russell Library in downtown Plymouth, turning both into successful cultural centers for the benefit and enjoyment of area residents and visitors. His students, many of whom are now serious artists in their own right, soon became his teachers, as influential in his life and artistic career as the acclaimed artists who more formally mentored him along the way. Copies of Kusmin's book will be available for purchase and signing during the Feb. 24 program. For more information about the Hingham Public Library, go to www.hinghamlibrary.org or call 781-741-1405. To learn more about Kusmin, his art and his book, visit kusminarts.com and like Kusmin Arts on Facebook. Email andrew@kusminarts.com or call the Kusmin Gallery at 508-746-9215 to check its current hours, arrange a visit or learn more about the classes he offers. "Treasured Trash" is open to the public in the library's Dolphin Gallery through Feb. 28. Hingham Public Library & North River Arts Society, Dec. 29, 2019-Feb. 28, 2019: "Treasured Trash"
PLYMOUTH PUBLIC LIBRARY GALLERY: Joint show of the work of Andrew Kusmin and Judy Quinn, Dec. 2017 - "Oil and Water Do Mix"